Taken on this day last year, a close up of witch hazel blossom. Hamamelis is a super shrub/small tree that flowers in January – March, depending on the variety. I love the waxy petals, like orange peel. They make hamamelis a very useful plant for adding winter colour to the garden. But the best thing of all is their spicy scent. 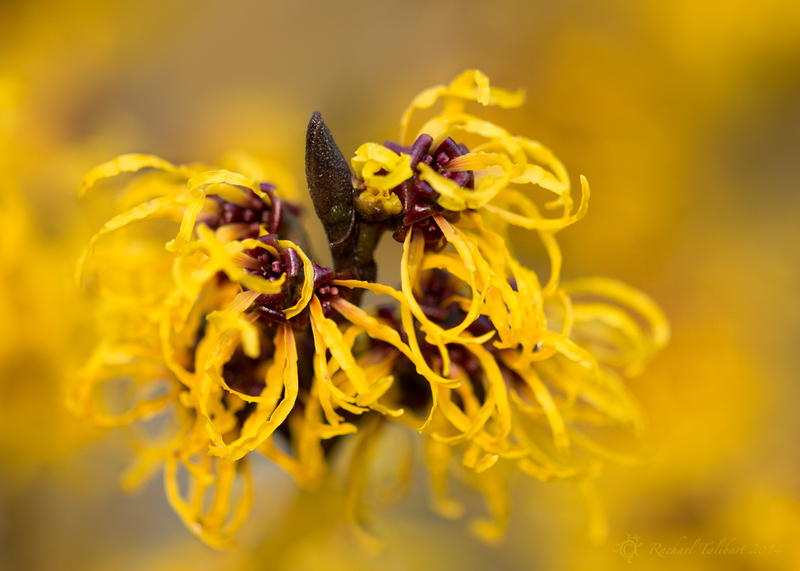 This entry was posted in garden, photography and tagged 365 redux, 365/17, gardening, hamamelis, plant photography, shrub, witch hazel by Rachael. Bookmark the permalink. Yes I always think of orange or lemon peel too. Thanks. It is quite a unique flower. That reminds me to go look at my witch hazel to see if it is starting to bloom…. I think it is a little early for Illinois. It was a little early for here too. Last winter we had an unusually mild, and very wet, winter. I like the effect here. What lens/settings did you use to get the background blur? Certainly one of the coolest plants I’ve ever seen. Great capture!